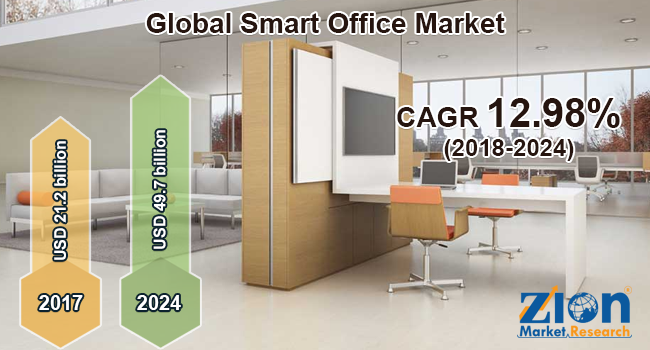 Global smart office market expected to reach approximately USD 49.7 billion by 2024, at a CAGR of slightly above 12.98% between 2018 and 2024. The rising integration of Internet of Things (IoT) in smart office is anticipated to drive the smart office market in the forecast time period. The report covers a forecast and an analysis of the smart office market on a global and regional level. The study provides historical data from 2015 to 2017 along with a forecast from 2018 to 2024 based on revenue (USD Billion). The study includes drivers and restraints of the smart office market along with the impact they have on the demand over the forecast period. Additionally, the report includes the study of opportunities available in the smart office market on a global level. This report offers a comprehensive market analysis along with market trends, drivers, and restraints of the smart office market. This report includes a detailed competitive scenario and product portfolio of the key vendors. To understand the competitive landscape in the market, an analysis of Porter’s Five Forces Model for the market has also been included. The study encompasses a market attractiveness analysis, wherein all the segments are benchmarked based on their market size, growth rate, and general attractiveness. The smart office market is segmented on the basis of product, building, component, end-user, and region. The product segment includes energy management system, smart HVAC control system, smart lighting, security, and access control system, audio-video conferencing system, fire, and safety control system, actuators, dampers, smart vents, pumps and fans, and VAV and FCU controllers. The component segment includes hardware, software, and service. The building segment includes retrofit and new building. IT and telecom, BFSI, healthcare, education, and others comprise the end-user segment of this market. By geography, the market is segmented into North America, Europe, Latin America, Asia Pacific, and the Middle East and Africa. Each region has been further segmented into countries, such as the U.S., Canada, Mexico, UK, France, Germany, China, India, Japan, South Korea, Brazil, Argentina, and GCC countries. The report covers a detailed competitive outlook including the market share and company profiles of the key participants operating in the global smart office market, such as Honeywell International, Inc., ABB Ltd., Cisco Systems, Johnson Controls International PLC, Crestron Electronics, Inc., Siemens AG, Lutron Electronics Co., Inc., and United Technologies Corporation.